Opposition activist Alexey Navalny suffered a further blow to his hopes of running in Russia’s 2018 presidential election, after the Supreme Court Presidium dismissed a complaint seeking to override the ban on his participation. The decision not to look into Navalny’s complaint was taken on January 22, but information about this was released only on January 26, Interfax news agency reported on Friday. It dealt with the decision of Russia’s Central Elections Commission, which on December 25 refused to allow Navalny to start preparations for the 2018 campaign because of the five-year suspended sentence he received in February 2017. 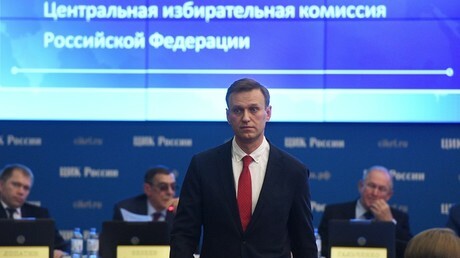 Navalny contested the ban in the Supreme Court, which recognized it as lawful. The activist then took the case to the Supreme Court Appeals Commission, where it was also rejected. On Friday, the lawyer of Navalny’s NGO Foundation for Countering Corruption, Ivan Zhdanov, mocked the ruling by tweeting that the refusal was issued in record time, while other cases spent “many months” in the Supreme Court. He did not back up his claim with any particular examples. In late November 2017, a Moscow court ordered Navalny to return the money donated to his elections HQ by a man who said that at the time he made the donation he did not know that the law forbids the activist from participation in elections.